On November 12th while at the Jungmun tourist complex on Jeju’s south coast, I happened to walk through the lobby of a large luxury hotel. 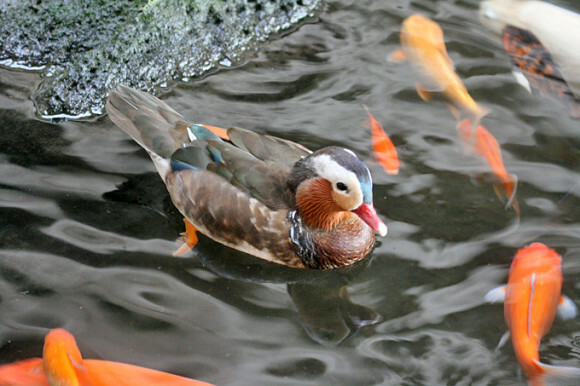 I was more than a little surprised to see a pair (one male, one female) of Mandarin Ducks Aix galericulata in a small pond in the lobby, which was also occupied by about 50 Koi fish. 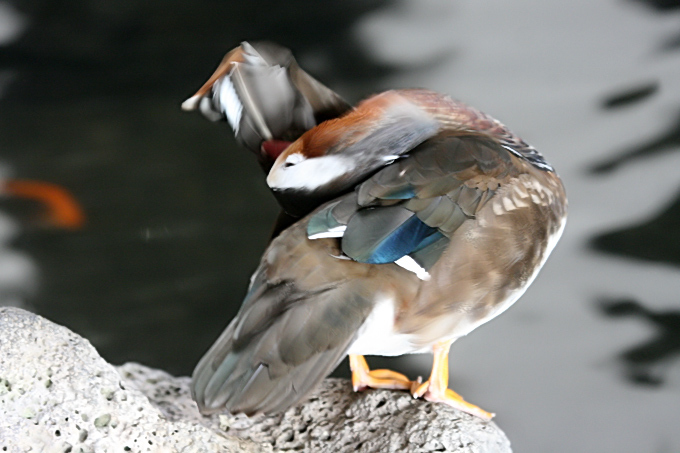 The Mandarin Duck is widely considered in Korea to be a symbol of love and fidelity. It is an uncommon species globally with a declining world population of only 65,000 (BirdLife International 2013). The Korea National Parks website describes them as a “rare” species in Korea and as a National Natural Monument (KNP 2013). They are usually very shy in the wild and liable to flush at the slightest disturbance. 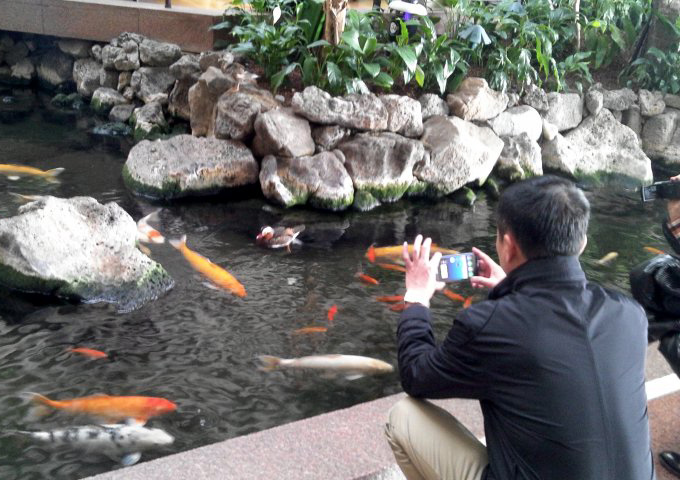 Here, on an artificial pond in the lobby of a high-class hotel, they were panicking every time someone walked past them. They appeared to be trying to fly away and were crashing into the sides of the pond. They were unable to fly, because their wings appear to have been pinioned, or perhaps the flight feathers were clipped – I was unable to get a clear image of the extent of the damage to their extended wings. I contacted the Jeju Wildlife Rescue Centre, who informed me that unless the birds were first injured in the wild, it’s unlawful to clip their wings and have them inside a hotel lobby (but it seems like there might have been some uncertainty, as it may be a bit of a legal grey area?). I returned last week to get some better images, and the Mandarin Ducks were still there. They were less panicky, and were actually begging for food from tourists, who can purchase fish pellets in the lobby to feed to the Koi. I tried to ask the desk staff if the ducks had been injured, but all I got was confused looks. Legal or illegal? Moral or immoral? How can a native wild species be held in captivity in this way in a hotel lobby? As a Birds Korea member, I am therefore asking Birds Korea and contacts on Jeju to help to get these birds either released into the wild or in the worst case to be taken to a proper wildlife rescue facility. The hotel staff and management need to be informed of the cruelty of keeping such shy wild birds in a tiny pond with their wings clipped. 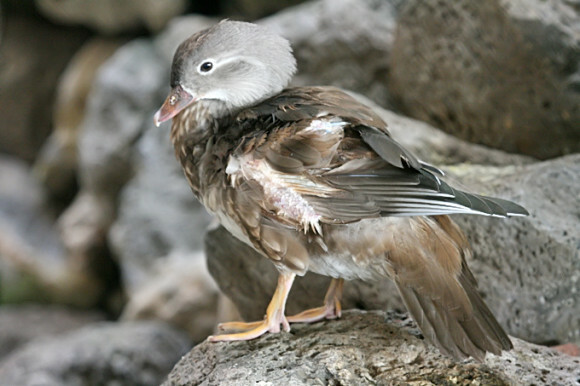 And hotel guests need to ask: are Mandarin Ducks held in these conditions symbols of love or of animal cruelty? International (2013) Species factsheet: Aix galericulata. Downloaded from http://www.birdlife.org on 19/11/2013. BirdLife International (2013) IUCN Red List for birds. Downloaded from http://www.birdlife.org on 19/11/2013.